Lennon’s loss of control could be seen as the ultimate representaion of the hopelessness of the hapless 20th century rock star. During the final years of his life Lennon, who had always sung of freeing the mind, was utterly confined and alienated by his massive popularity. Cut up officious German voice, zooms in and out of focus, and echoes incoherently about in vast grey chambers, ordering the mashing of all brass bands by giant rotor blades. But the brass bands are irrepressible and parp from beyond the grave. Their bodies were gone, but their art lingered on. They cannot mash us all. Frozen gun shot beats decelerated to 3 rpm, energy sucked into circuit boards and blasted out in terror or joy? Is that ‘Casino Royale’ in your kitchen? Technology as a means of control, tracking, scanning, spying or as the liberator of humans from their present lamentable condition. The internet has been called a great equaliser, but perhaps the atom bomb is more so. Closed circuit TV crackle – On screen: Ocsid presenting technology as a step or series of steps leading either up or down? Or are they just leading? Fractured Radio broadcasts hijacked and ruptured… ‘Ominous’ replaces ‘Edvard’ as his name on days like these! Massive solitary pulses, drones, hums, machines taking over? Over what? Late Throbbing Gristle into Coil – elph and beyond. It’s sinister but sometimes once is not enough! Glitches twitch… The spur of ‘In Esse’? Improvisation? It can’t be the theme from ‘Countdown’ can it? It could be considered post-industrial even though that’s too much of a defining cliche for sound sculpture as unique and unsettling as this. 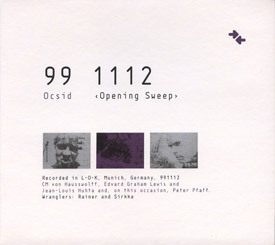 Opening Sweep is Ocsid’s second CD. For this performance, recorded on November 12, 1999, the trio of CM von Hausswolff, Edvard Graham Lewis and Jean-Louis Huhta was augmented by Peter Pfaff, all performing on samplers, computers and electronics. Recorded in a Munich club, this mammoth session started at 10 pm and ended at 3:30 am, but the CD only contains the first 75 minutes. The music covers a wide range, from rhythm-deprived soundscapes to segments of rave-like energy. Sound sources go from ethereal synthesizer patches to snippets of radio/TV broadcast and cheesy ‘60s electronic pop music. The continuous set lacks cohesion: there are moments where it seems no-one is aware of what the others are doing, as voice samples come in and out at random. Things come together and then fall apart again, but someone always manage to keep the piece moving forward. Now, when faced with such an edited set, one must ask the question: why stop here? Why brutally cut the piece at 75:04 instead of 70 or 78 minutes? In the last 120 seconds the music takes a turn toward noise as the texture disintegrates and when it stops on a dime the listener is left clueless. There are stronger experimental sets out there, but this one is intriguing enough to be worthwhile. Not for everybody, of course. CM von Hausswolff, Edvard Graham Lewis, and Jean-Louis Huhta team up as Ocsid for a highly successful melding of styles covering laptopy academic music, cut-up collage, techno, and dark ambient. A synthetic drone pervades much of the album, but it is never soothing. Disconcerting sounds penetrate and attack the constantly evolving thread of synth while rhythms ranging from abstract noise collisions to subdued techno passages gradually make their presence felt. Mutilated vocal samples, shrill bits of resonant squeals, and glitchy clicks make for very edgy, disturbing electronics. Lighter, more conventional elements enter the mix at points, but their very presence somehow makes it more disturbing. Dense and dream-like, each new listen still finds me wondering what’s around the next corner.